Leading professional supplier of luxury hair and beauty products online, Hairtrade.com, has unveiled a revolutionary new range of ‘onepiece’ hair extensions within the company’s I&K brand of extensions. I&K’s Onepiece Synthetic Clip In hair extensions, made from the most luxurious synthetic fibre, is a full set of hair that can be placed under your own to instantly add volume and length. 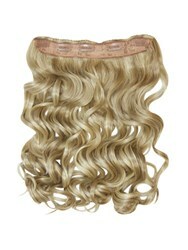 It is now exclusively available on Hairtrade.com in a wavy style in 8 shades, including those suitable for highlighted hair. Unlike individual pieces of hair that take longer to place and secure, the product from I&K’s synthetic hair collection can be fitted in approximately one minute. The synthetic fibre gives a natural look while the clips keep the hair secure. The hairpiece can be blended easily, concealing the clips, as it is a smooth and more natural-looking single layer of extensions. The Onepiece Synthetic Clip In Hair Extensions are styled wavy and are 24 inches long when straight. A free colour match service is also offered by Hairtrade.com which can be completed by simply emailing a photo of your hair colour. A Hairtrade.com colour specialist will then advise on the correct shade to achieve the desired result. Laura Meredith at Hairtrade.com said: “The launch of the I&K Onepiece Synthetic Clip In Hair Extensions has been in the works for a while now so it is a very exciting time for Hairtrade.com as we welcome the product to the market. The I&K Onepiece Synthetic Clip In Hair Extensions are priced at £19.99, and are available alongside a range of human hair extensions and hair care products online at http://www.hairtrade.com or by calling 0845 051 0342.